In Queen of Katwe, a Ugandan girl sees her world rapidly change after being introduced to the game of chess. 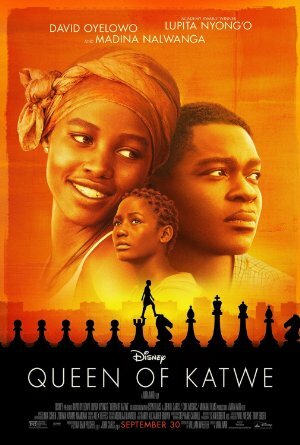 This Disney film about Ugandan chess prodigy Phiona Mutesi (played by Madina Nalwanga), introduced to the game by Robert Katende (David Oyewelo) also stars Lupita Nyong'o as her mother Harriet, and is directed by Mira Nair. It is based on the true story of Phiona's introduction to chess and ascension to very impressive chess heights. The film was championed by Ugandan Disney executive Tendo Nagenda. Madina Nalwanga and Lupita Nyong'o are interviewed on this week's episode of Pop Culture Happy Hour, and it is really wonderful. This was LOVELY. I enjoyed the heck out if it, and it was much better for my state of mind than watching the 2nd presidential debate. I liked that it had all the typical tropes and story beats of a Disney movie, but deeper layers as well. Mira Nair was a good choice, experienced, dramatic in a heavyhanded way, but also very aware of the real emotions and anxieties of a scene. Just saw it yesterday with my 10 year old daughter, and it really is a wonderful movie. She really liked it, too. I loved the ending for its down-to-earth realism. Everyone is better off because of Phiona's abilities, but no one is crazy rich or famous. They are secure. The kids got to go to school. The made it up out of the slums, and can maybe build a little from there. It's nice to see a story where the happy ending is "we have a roof and a chance for some education." Seeing the real people interacting with the actors really drives that home. And the acting was top-notch. Not a false note in the whole movie. Best scene: Robert Katende telling his wife that he passed up the engineering supervisor job to continue his work with the kids. And she says she knew that's the kind of person he was when she married him, and this is their family's work. Good opportunity there to talk with my kid about the importance of having values higher than making the highest possible amount of money. I caught it last week, and thoroughly enjoyed myself. It has all the marks of a feel good Disney sports movie, but without some of the unfortunate implications that makes other movies in this genre (Remember the Titans, The Blind Side) feel kind of ...corny. It's sweet, and again, I liked that it was a movie about people doing good, helping each other out, and generally not being horrible individuals despite their terrible circumstances. Just saw this tonight — I really enjoyed it. The chess, as far as I can tell, was realistic as well; I noticed in the credits that Robert Katende was listed as the chess consultant for the movie.